But first, some context. The Cultural Revolution began in 1966 as a way for Mao Zedong to solidify his power following the failure of the "Great Leap Forward", a plan for the economic reform of China, and as a way to "purge" capitalist values from the Communist party of China. It was carried out primarily by Mao Zedong and his "Gang of Four", including his wife Jiang Qing, who was given authority over the arts. Intellectuals and perceived class enemies were killed or sent to work in the countryside. At the end of the Cultural Revolution, an estimated 1 million were killed (though figures range from 500,000 to 8 million) and 16 million had been sent to work in the countryside. Western music in this time was outlawed, music schools closed, and instruments destroyed. When Isaac Stern visited Shanghai to perform in 1979, when the revolution had just ended, he couldn't find even one playable piano, as they had all been destroyed. During this time professors and students of classical music were often sent to the countryside or killed. Tan Shuzhen, who was vice director of the Shanghai Conservatory, was locked and beaten in a small, dark closet for 9 months before he was released and forced to work as a janitor. This persecution was justified by the reasoning that Western music stood for capitalist values and was a tool of the upper class. All music, Mao Zedong said "belong[s] to definite classes and [is] geared to definite political lines. There is, in fact, no such thing as art for art’s sake". "Long live Chairman Mao!" "Long live the Communist Party! Thanks to our dear ones, the Workers'and Peasants' Red Army!" "There were not many forms of entertainment. The word 'entertainment' was considered a dirty bourgeois word. The opera was something else. It was a proletarian statement. 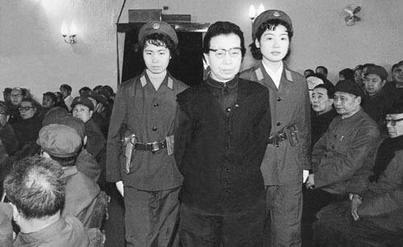 The revolutionary operas were created by Madam Mao and Comrade Jiang Ching. To love or not to love the operas was a serious political attitude. It meant to be or not to be a revolutionary." While it was clear that learning or teaching Western music was criminal, many in this time still learned in secret. Vera Tsu Weiling shared her experience of playing the violin during the cultural revolution in this interview. She was taught by her father (who was taught by a Jewish teacher) for 13 years, practicing in a small, dark basement with her muted violin. When a piece of sheet music was brought from the Soviet Union, someone would stay up all night to copy the music in pencil, returning the sheet music to the owner in the morning. For 13 years, Weiling practiced violin without hearing a recording of classical music. When Mao died in 1976, the "Gang of Four" and the Cultural Revolution fell apart. Colleges reopened and Weiling and other students could openly play their instruments. But the 10 years of cultural revolution couldn't be so easily wiped away, she says She said "We didn't know about color, expression, or interpretation. We didn't know about using different parts of the bow to make music." "You could hardly breathe when you heard such a beautiful sound, coming from the same instrument! We had no idea, because we hadn't been able to hear anything from the West...To hear a violinist like this live? No, never. Isaac Stern was the first one, and it was like being in the desert for so long, and then all of a sudden -- water! A fountain!" 35 years later, Yu Long, who directs the Shanghai Symphony, China Philharmonic, and Guangzhou Symphony, helped create the "Shanghai Isaac Stern International Violin Competition" to acknowledge the impact Stern had on China. With an international music competition, globally recognized musicians and symphonies, it seems like China has recovered from the Cultural Revolution stronger than ever. Today, an estimated 40-60 million Chinese children take piano lessons, and almost as many people play the violin. But despite the flood of students, Chinese music education is frequently criticized as overemphasizing technical abilities at the expense of creativity. Keng Zhou, dean of the International Piano Academy at the Shanghai Conservatory, as well as other recent teachers have been trying to fight this attitude. He states in an interview with the BBC that, "The Chinese want to force their kids to practice piano,” and “It is too old a method. It needs to be more about enjoying playing the piano. For most students it will kill your hobby and kill your enjoyment." Instead, he hopes "more and more kids can love to play from their hearts. Which one of these philosophies wins out is yet to be seen, it is clear that classical music has a future in China.